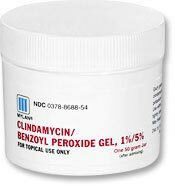 Clindamycin (1%) as Clindamycin Phosphate and Benzoyl Peroxide (5%). Carbomer, propylene glycol, potassium hydroxide, and purified water. clears you up pretty well cheap lasts a long time can be drying I started this when I was 16 and it cleared me in a matter of two months. I used this for another year and a half before my insurance wouldn't pick it up anymore. Sadly, I started breaking out again after I couldn't get this! Argh!!! But worked super well while I was on it. Drying and does next to nothing. It does help with large pimples but doesn't work on blackheads (or anything else). clears up acne spot by spot after about 2 weeks works very slow dries out skin excessively burning sensation not a very good spot treatment, I have not seen any significant results from using this product.